Port Foster is one of the safest harbours in Antarctica, located in Deception Island in the South Shetland Islands. The harbour was known to sealers as early as 1820, and in its early history was called Port Williams, after Captain William Smith's brig, Williams; or Yankee Harbor, because of the number of American sealers who harboured there. A few years later it was named Port Foster after Henry Foster, commander of HMS Chanticleer, who made pendulum and magnetic observations in this harbour in 1829. The latter name has become established by usage, while the former have remained for other features in the same archipelago — Williams Point and Yankee Harbor. 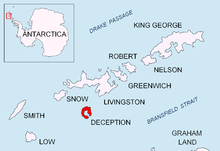 The center of Deception Island is a caldera, formed by a gigantic volcanic eruption and later flooded. This has created the 10 by 7 km (6.2 by 4.3 mi) basin-like harbour of Port Foster. The entrance to Port Foster is only 560 m (1,840 ft) wide and is named Neptune's Bellows. The benthic zone of Port Foster is of great ecological interest due to the natural disturbance induced by the volcanic activity. Two areas have been collectively protected as Antarctic Specially Protected Area (ASPA) No.145. ^ "Port Foster, Deception Island, South Shetland Islands" (PDF). Management Plan for Antarctic Specially Protected Area No. 145: Measure 3, Appendix 2. Antarctic Treaty Secretariat. 2005. Retrieved 2013-09-29. This article incorporates public domain material from the United States Geological Survey document "Port Foster" (content from the Geographic Names Information System). This page was last edited on 26 February 2019, at 07:26 (UTC).